Looking at this giant number… $8,000,000… is kind of like staring at Mount Fuji before you start to climb. A little bit intimidating. Perhaps downright terrifying. That’s why we need to have a realistic plan of how we’re going to climb it. This may surprise you, but we’re going to do it backwards. Instead of starting at the bottom of the mountain, we’re going straight to the top. And why not? It’s exhilarating. The view is beautiful from up here. And it’s a lot easier to think about climbing DOWN the mountain than it is climbing up. You must think I’m crazy, but let me explain my parable. When you’re raising a big pile of moolah, you need a plan, and that plan looks a lot like a mountain. People have different names for it. The gift chart, a gift pyramid, a gift table, a donor plan. We’ll call it Mount Donor, and be satisfied with the fact that there is a more accurate, but boring technical term for it in the language of “consulteese”. Mount donor is a pile made up of $8,000,000 worth of gifts with the biggest gifts on top supported by smaller and smaller gifts until it gets down to the base. The top necessarily has a few large gifts, and the bottom has many smaller gifts. Bill Phillips Rachel Viz Judah Johnson Chuck Hunt Etc. Joe Hardy Josh Dooley Peter Vizzini Noah Ceyssens Etc. Helena Fuller Paul Sterret Dori Platte Andy Hatfield Etc. Pierre Compoare Evan Hutchinson Etc. Madonna Germann Greg Snyder Etc. Bob Garrett Melissa Brown Etc. Each row tells us how many gifts we’ll need of a certain size, how many prospects we’ll need to get this number of gifts, and the impact the gifts have on our gift total. Now you can see why our donor depth chart is so useful. We’re able to build our Mount Donor using real information. We have three donors with the potential of giving a $1,000,000 gift? Great! That means that we have a good possibility of getting one gift in that range. It’s very important that we connect the number of “prospects needed” with actual people who are connected to our mission and have the capacity to give that amount. If no people are connected to the numbers in the chart, it is a work of fiction rather than an actionable plan. Because that’s what this Mount Donor map is supposed to be: the cornerstone of the plan that will actually get the job done. Rocks (and donors) roll down the mountain. When we start doing our feasibility study, we’re going to start talking to the people at the top of the mountain. We will ask what they think about the sisters, and whether they think that they will be able to be a part of Mount Donor. Here, it’s important to remember that the wealth screening information is incomplete. We won’t have a full understanding of each person’s capacity to give until we get into the room with them. An important reason to start at the top is that it is very unlikely that people will give more than they are asked to give. I’ve heard of a few instances where the person was asked to give $20,000, then said, “No, I’d better give you $25,000.” This is the exception. Their likely response is that they can give at the expected level, a lower level, or not at all. This process works great. Say we ask Bill for a $1,000,000 gift. He says that he can’t do that right now, but he can give a $500,000 gift. He moves a little way down the mountain and suddenly the map is looking a little fuller. As we work through our biggest potential donors, we’ll start getting commitments that will fill out the top tier of Mount Donor. The second thing that we’re going to be doing with this feasibility study is recruiting volunteers. It’s a fact of fundraising that donors give to givers. Finding volunteers who are willing to make asks to their friends and associates is a real game changer. When Bill, who is married to Rachel’s aunt, asks Rachel to make a gift to this campaign that he’s supporting, Rachel is going to give this ask a lot more thought than if the ask came from someone she hardly knows. So part of this feasibility study will be asking donors who have committed to giving if they would be willing to reach out to some of their contacts on behalf of the campaign. We’ll probably do this the old fashioned way by inviting them to be on the campaign committee. We will reserve the leadership roles for the committee for those people who have the ability to make the largest gifts. This only make logical sense. The person who gives the most should have the opportunity to have the most visible role. They can refuse it if they want to, but should be given that option. We do have to be careful how we do this. I heard a horror story recently about a fundraising consultant who was, shall we say, indelicate with his approach to getting volunteer involvement. In his first meeting with a potential donor, he handed them a list of people they had on their gift chart and said, “Who on this list will you ask to make a gift to this campaign?” The donor felt ambushed, and didn’t end up getting involved OR giving a gift. We’re asking for a lot here, so we have to be prudent. We’ll invite them to be on the campaign committee, explain that it will mean soliciting a few additional gifts, and putting their name on the campaign letterhead. I was talking about Mount Donor to the superior of an order who was trying to raise money for a new chapel. They were doing the campaign without a campaign consultant, so they didn’t have have their plan mapped out. When I shared with her the breakdown of how a gift chart should work, she took it in a different direction that I expected. She made a smaller version of the gift chart and included it in the next newsletter that she sent to her supporters. It was only for about 5% of their campaign goal, but it still asked for some sizeable gifts. Would you believe that by the time her next newsletter rolled around, she had raised exactly the amount she asked for in her gift table? This was made possible by some big gifts, many of which were larger than she ever expected. While I don’t recommend just broadcasting your gift chart to the wide world, it goes to show you that asking for big gifts for your campaign is the only way to go. You don’t get $25,000 gifts when you’re asking for $10 gifts. The point of the story is that planning in fundraising works, even if in unexpected ways. I think you’ll have quite an adventure swishing down these slopes! Today’s post is the sixth letter in the new volume of the “Letters from the Almoner” series. These fictional letters will open a window into conversations between a professional fundraiser and a religious sister who running a capital campaign to raise money to build a new monastery. Would you like to learn more about raising money for Church and Ministry? Check out Letters From The Almoner, now available on Amazon.com. Image courtesy of Pixabay.com, via Creative Commons License, no rights reserved. Nathan Krupa started raising money professionally for Golden Harvest Food Bank in 2011. When he discovered that fundraising can make wonderful things happen, his profession became his passion and the Almoner was born. 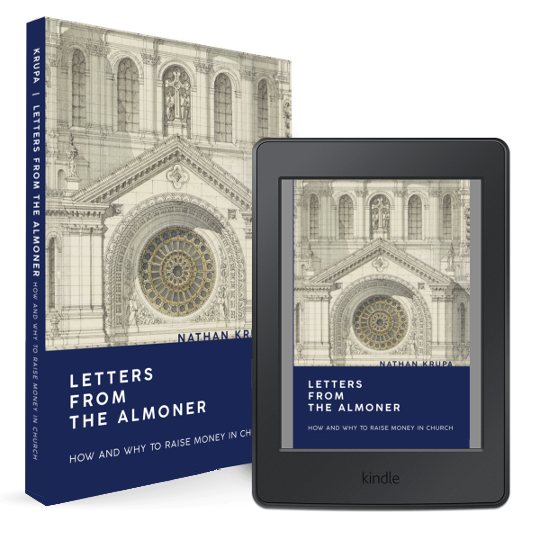 His first book on raising money in the Church, Letters from the Almoner, is now available on Amazon.